With sounds and colors that explode off the page, JIMI: SOUNDS LIKE A RAINBOW (written by Gary Golio and illustrated by Javaka Steptoe), is a glorious tribute to Seattle's multicultural creativity and the genius of Jimi Hendrix. Kids and parents alike will be inspired by Hendrix's passion for music and art, and his single-minded vision to express that passion through the voice of an electric guitar. 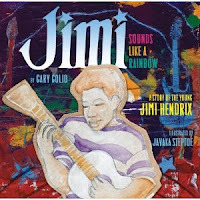 Golio's words sing and Steptoe's illustrations dance, making the reader want to put on some Hendrix (right now!) and whirl around the room. Today, as part of his blog tour, I've invited Gary to share his thoughts about how race and racism affected Hendrix's music and music. In many ways, Jimi Hendrix’ life was spent seeking and promoting wholeness or healing, and much of his creative work can be looked at through that lens. Multicolored in his racial heritage (a mix of African, European, and Cherokee ancestry), he grew up in Seattle at a time—the 1950s—when it was proudly called the Rainbow City. Jimi went to school with Asians (Chinese, Japanese, Filippinos), Hispanics (South Americans, Mexicans), African-Americans, whites, and American Indians—people of all colors, who co-existed in relative harmony. Jimi even lived for a time at Seattle’s Yesler Terrace, one of the first integrated public housing projects in the U.S. While he could listen to black radio stations (with music by black musicians) beginning only in 1958, Jimi had seen Elvis—the great White Wonder who fearlessly did his take on what was still considered Race music (gospel, jazz, blues)—in September of 1957, when he was 14, at a Seattle stadium. Before that, from the time he was very young, Jimi heard a wide variety of genres played (on record) and sung by his father right at home. As a teenager, he listened to Dean Martin and Frank Sinatra alongside Howlin’ Wolf, Lightnin’ Hopkins, B.B. King, and Chuck Berry. He had a place in his heart and mind for rock ‘n’ roll, the blues, jazz, pop, and gospel, and would later add Indian ragas, Flamenco guitar, Bach, and Handel to that heady mix. He even speculated about what “the blues scene” would be like on other planets, thoughts that arose from his love of science fiction and musings on extra-terrestrial life and intelligence. In 1966—a year before he was “discovered”—Jimi walked through Harlem carrying his Dylan albums and singing Bob’s praises, much to the bewilderment of the black community. When he arrived in London in September of that year, he dazzled young white English musicians in love with the blues (Cream, the Rolling Stones, the Who) not just with his virtuosic and authentic playing, but by being the first black musician (and man) most of these aficionados had ever met. In doing so, Jimi acted as much as an unofficial race diplomat as an ambassador of black music. When he formed the Jimi Hendrix Experience that same fall, he became the black leader of a band including two white musicians—something clearly ahead of its time. All that said, Jimi experienced racism throughout his life. He heard the unsavory epithets as a child, and as an adult was first referred to by European critics as “the Black Elvis” and “the Wild Man of Borneo”—terms which, while strangely praiseworthy in their intent, were clearly hurtful in their reference to Jimi’s “otherness” as a talented and feted noble savage. Still, he filled his songs early on with hopeful themes of Jungian wholeness—waterfall sanctuaries of creativity (May This Be Love), joyful interstellar exploration (Third Stone From The Sun), spiritual unity and togetherness (Are You Experienced?, One Rainy Wish)—while openly sharing with us his fears of psychic fragmentation (I Don’t Live Today, Love or Confusion, Castles Made of Sand). A very human being, Jimi Hendrix allowed painful as well as positive childhood experiences (poverty, multicultural inclusion, racism, exposure to the arts) to shape his optimistic, almost visionary approach to racial pluralism. He welcomed diversity in people and culture as much as in music, and believed that the art he offered—what he referred to as “electric church”—reflected a belief in tolerance strengthened by his friendship with Martin Luther King Jr. Surprising as it may seem, for those willing to open their ears and hearts, Jimi Hendrix may yet prove to be a powerful and positive role model for 21st-century children. An interview with Gary and Javaka will air on NPR's Weekend Edition in the coming weeks. Gary was also interviewed on WBZ, Boston's #1 station and is Author of the Month on Embracing the Child.